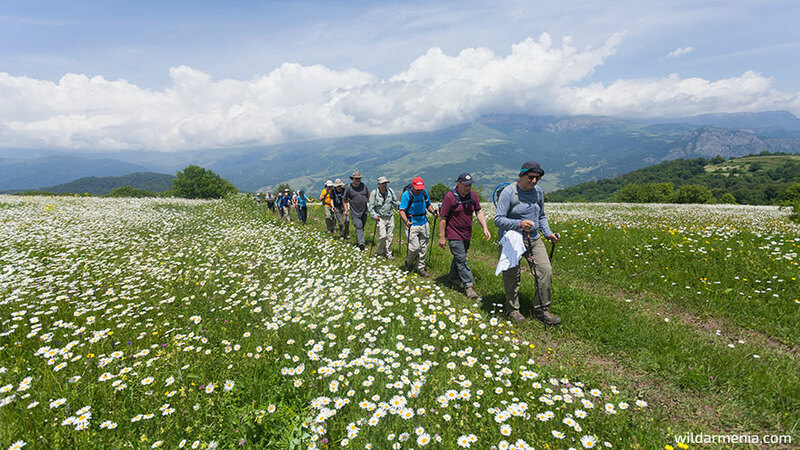 Hiking in Armenia is a great idea when you’re creating an itinerary for your upcoming trip. 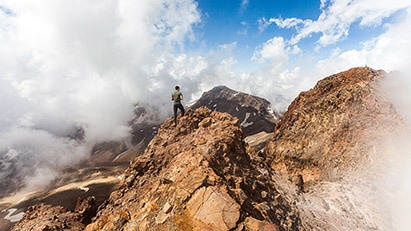 When it comes to hiking tours, Armenia is the best with its epic hiking trails and spectacular mountains. With its surprisingly changing terrain, mountains, valleys and canyons that hide real gems of architecture in their depths, Armenia offers different trekking routes and awesome hiking tours. The trail-building activity under rapid take up in the country makes Armenia a very attractive place for exploring new hiking trails. 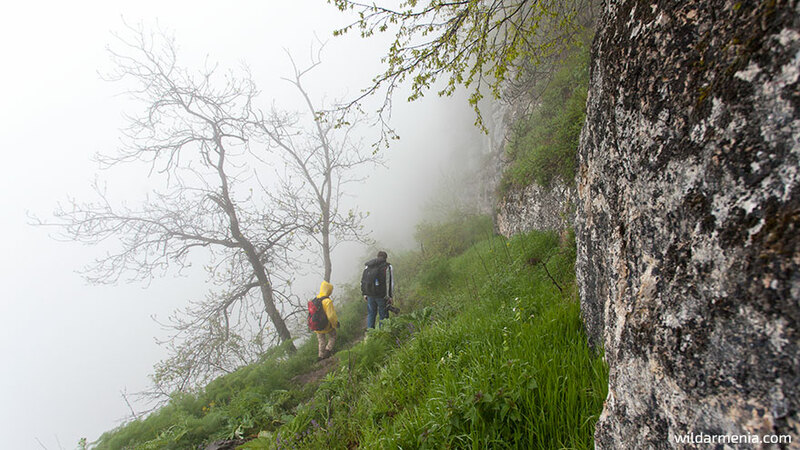 The following hike will guide you to a real fairy-tale.This hiking trail offers you incredibly nice walking in Armenia. If you happen to hike there in foggy weather, you will find yourself in the Avatar movie, once you see the gorge enclosed by rocks from the left side and bordering the narrow path from the right. Everything is meditative here. The forest, the sound of the river, the waterfall and the peaceful vibes of the valley. When you get to Lastiver caves, you will definitely hark back to your childhood, recalling many fairy tales describing such scenes. The tree houses will invite you to stay there forever, but I wouldn’t recommend it, because we have other attractions worth seeing in Armenia. So join us to explore more trekking routes in Armenia! If you plan to hike in Armenia, then you should not miss the hike of Geghama. 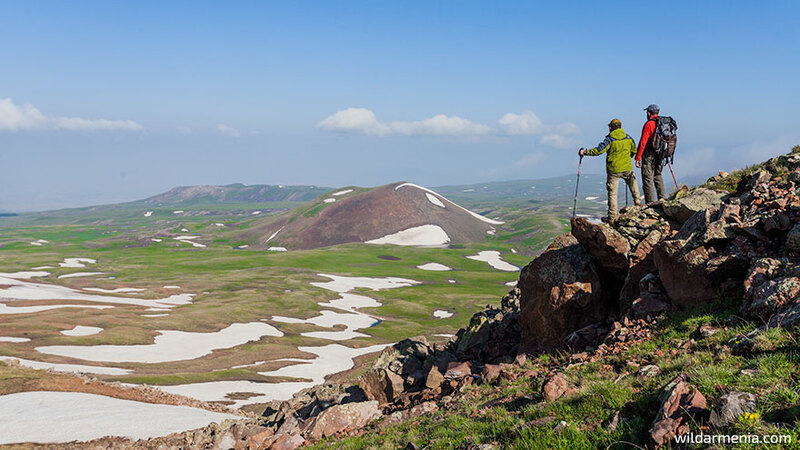 This mountain ridge stretches between Lake Sevan and the Ararat Plain and is a great multi-day hiking and trekking place for adventure-lovers. 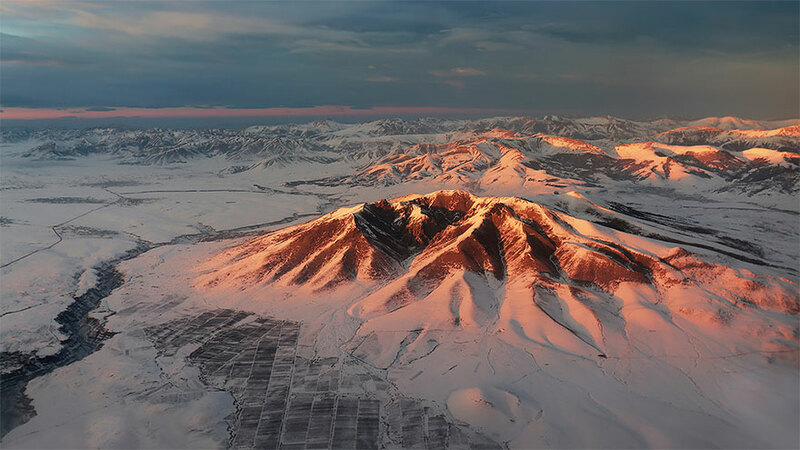 The highest point of the range, the extinct volcano Azhdahak is particularly interesting. It has a lake almost circular shape in its crater, formed by snow water. The best season to hike here is summer, especially July when it is blanketed in varicolored flowers. The never-ending horizon, volcanic red color of the mountain and enveloping clouds will make your hike magnificent. Moreover, the prehistoric petroglyphs scattered all over the mountain chain and special stone stelae called “dragon stone” make this trekking spot ideal for cultural tours as well. Come and see the dragons in Armenia and don’t worry please, they are far from any “Game of Thrones” battlefields! Located in the northern part of the country, Dilijan National Park is one of the most densely forested areas in Armenia. There are numerous hiking trails here and like many other cases in Armenia, you are going to see splendid architecture in lofty nature. Walking in Armenia becomes very mindful here because of its tranquil nature. The trekking routes and hiking trails here vary in difficulty levels, so every hiker will find an appropriate hike in the park. 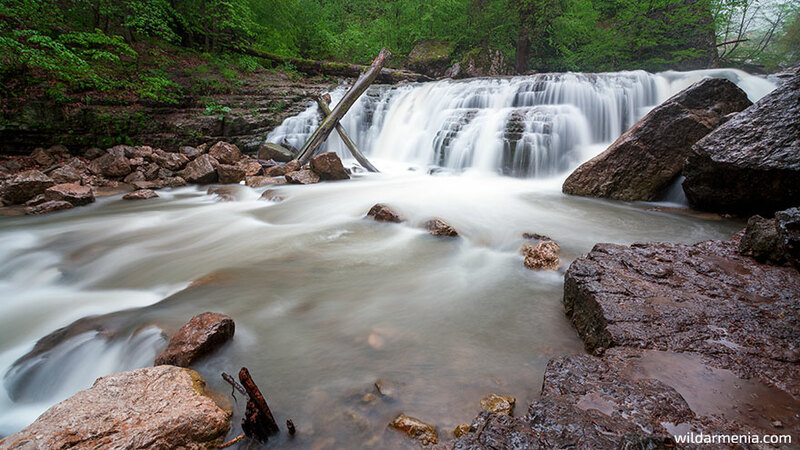 One of the most popular hiking trails is the one connecting Lake Parz to Lake Gosh. 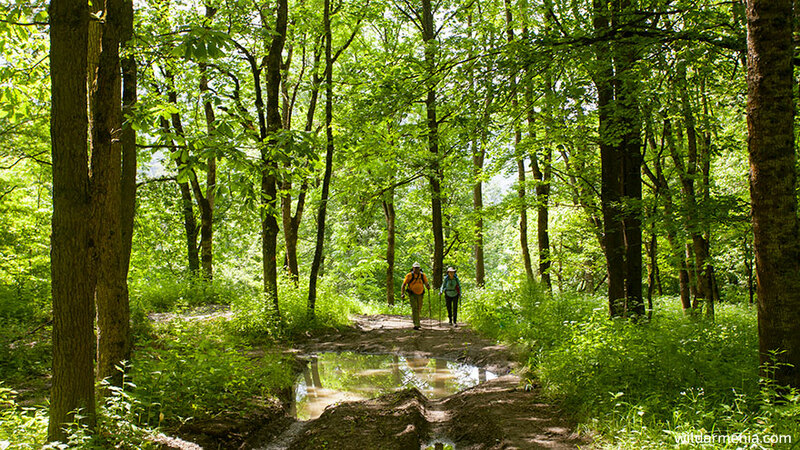 In 2018, more tourists are supposed to hike this newly-made trail by The Transcaucasian Trail-a company gaining international recognition. The fauna of the park is also very rich-you can see the largest Yew Grove in South Caucasus, located on a hiking trail to Agavnavank. Beware of eating all the berries from the bushes on the trails, because the native bears might starve. Our next hike will lift you up to the highest point of Armenia so you can watch this country from its highest heights. 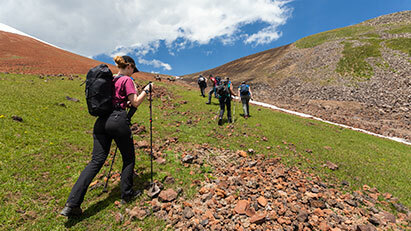 The mountain has four summits, and you can trek all of them if you take a multi-day hike, yet if you are an expertise hiker, you can do it in one day. This is a volcanic mountain so you can see the huge crater, which is very impressive. 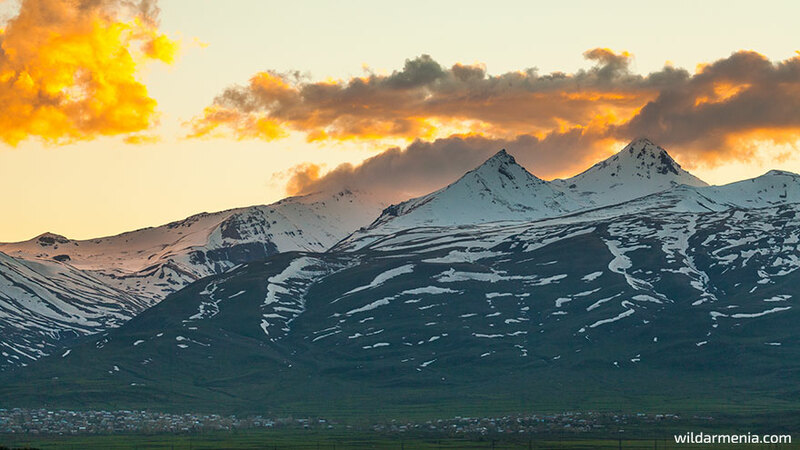 The flora and fauna of Aragats are very rich. If you don’t have any companions or guides with you, don’t worry, there are many species of birds all over the mountain who will most likely accompany you to the mountain top. 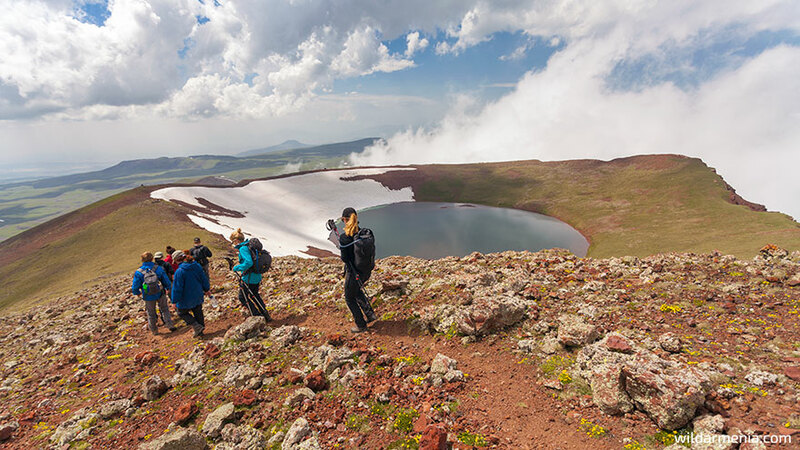 It is not safe to climb Aragats without a local guide, so we recommend you hire one of our hiking guides who will make your trip more enjoyable and involved. 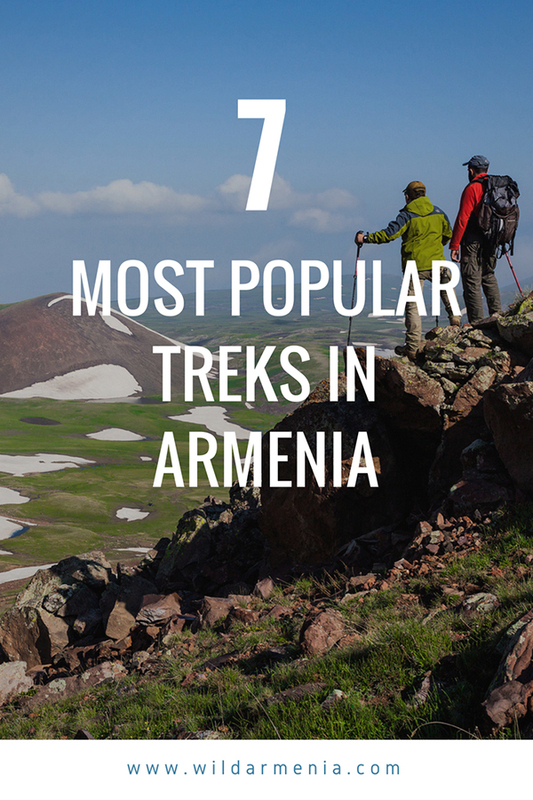 We highly recommend this hike in southern Armenia which has breathtaking beauty. You can camp on the slopes of Khustup and start your ascent early in the morning. The rocky peak of the mountain is extremely charming, and its slopes are sophisticated. Every 20 meters, it is possible to observe new flowers, it’s not accidental that a part of Khustup is included in the Zangezur State Reserve. The most impressive view opens from the top. Here, you will discover a beauty that is hard to withstand. 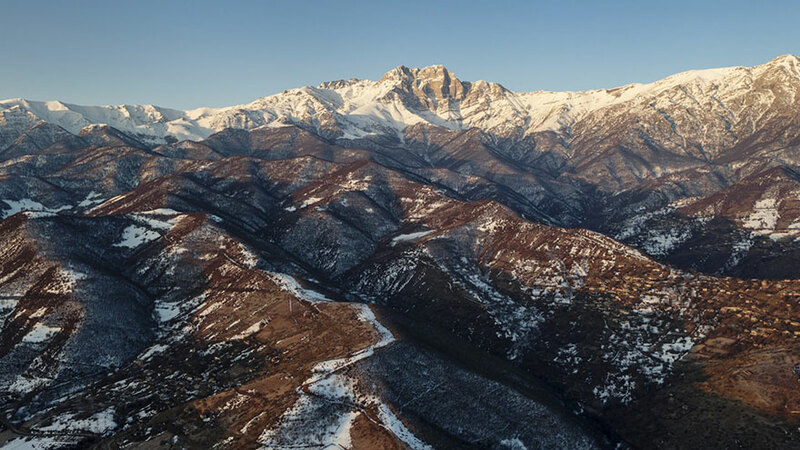 Hatis is the favorite mountain of Armenian alpinists and hikers. It is a perfect place for those mountain climbers, who want to stay in shape because it is in the vicinity of Yerevan and, hence, easy accessible. For this reason, the mountain is a great place for winter climbing as well. So, if you want a mountain hike in the winter, then don’t hesitate to follow us to Hatis. 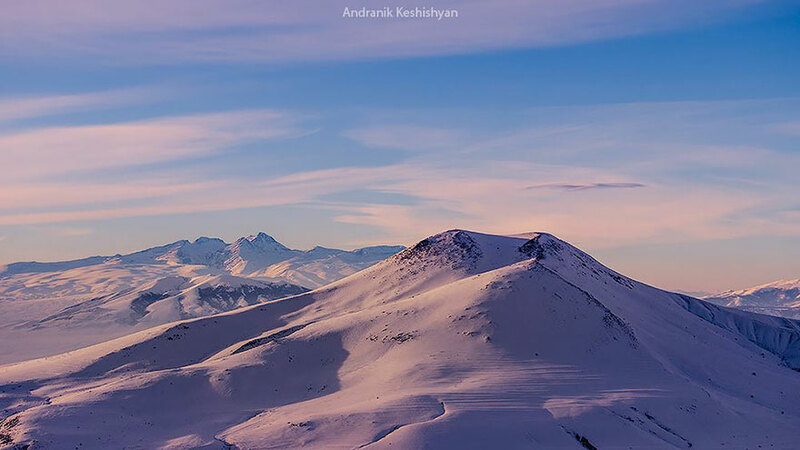 The view from the mountain top is fantastic when the weather is clear, and you can admire the picturesque view of Geghama, Aragats, Ararat and many other mountains from a prized lookout point. If the weather is bad, you can find a shelter inside an artificial cave on the mountain top. Our next mountain, Ara is another option for a winter hike. It offers an interesting trekking route, with its incredible views and high biodiversity (during spring and summer). The powerful vibes of this mountain will open you to the origin of the myths inspired by the mountain itself. It is also possible to ski on Ara Mountain, but you’d rather do it silently, so as not to disturb the bears living on the mountain. Experience our next one-day hiking tour, which, except having breathtaking beauty, is very interesting. You are going to see a very characteristic feature of the Armenian landscape: the harmonious conversation between nature and architecture. 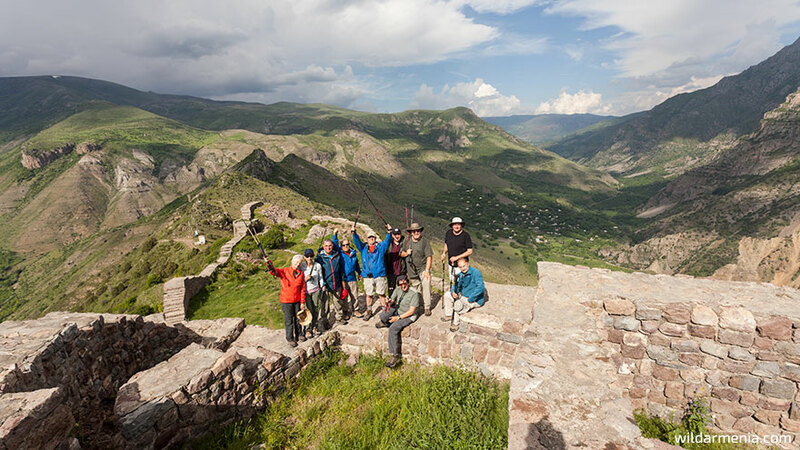 Smbataberd fortress, resting on an impregnable precipice, is naturally defended by gorges. After admiring the breathtaking scenery from the fortress you can continue your hike to Tsakhats Kar Monastery. Located about 3.5 km north from the fortress, this 10th century monastic complex was an important educational center in the Middle Ages. Once again, you will be surprised by the perfect match of the man-made architecture and nature. The existence of Bezoar goats in this region makes this hike exceptionally unique. So take your chance to explore this fantastic corner of Armenia with us! So, here comes our bonus hike, which is incredibly beautiful. Join us to head for the village of Old Khot, also called the Armenian Machu Picchu. 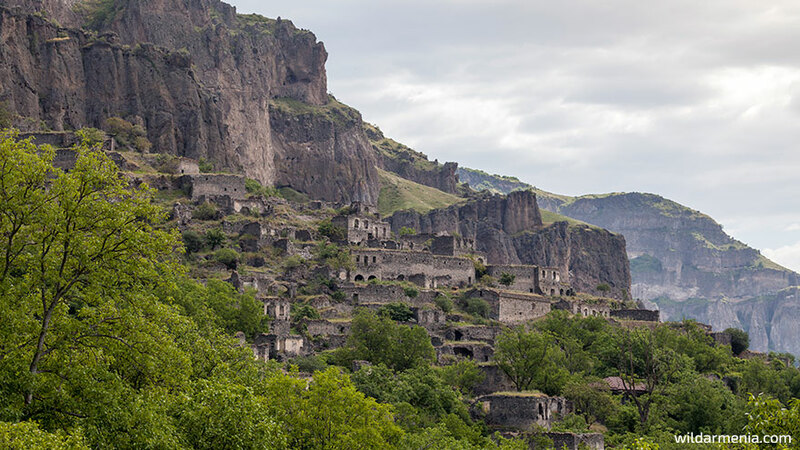 This hike will help you to discover hidden Armenia, its past has remained a past because this village has been left untouched since it was abandoned in the 1970s. The village houses here have a terrace-like layout which makes the general plan of the settlement blend with nature. The pointed rocks will make you feel like you’re in Cappadocia. 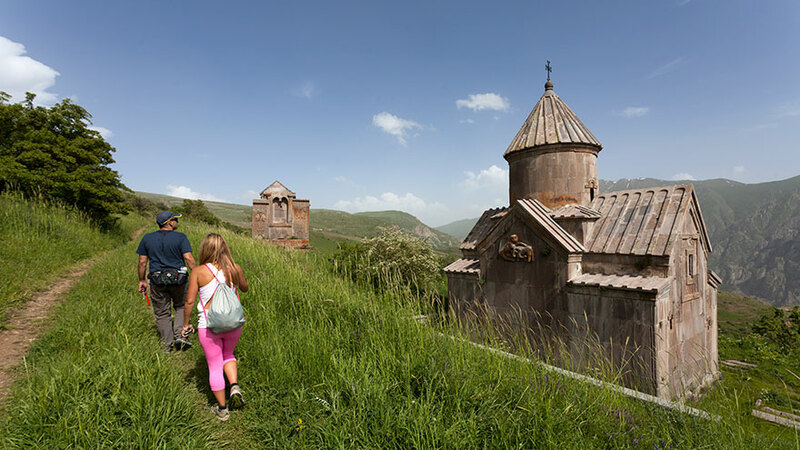 But this is South Armenia, famous for its awesome nature, old settlements, fantastic monasteries, and cave-made villages that make very special trekking routes in Armenia. You can even find the secret of longevity here, which is… mulberry vodka. Feeling motivated to take one of these trekking routes? 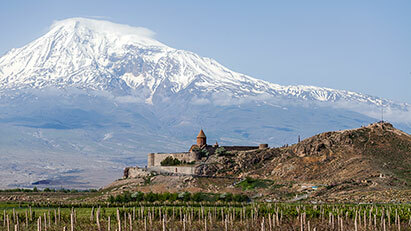 Check out our hiking tours in Armenia! 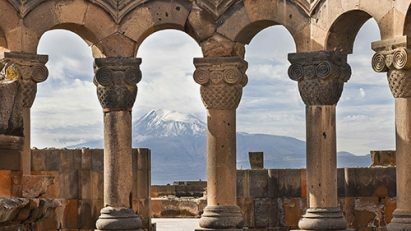 UNESCO sites in Armenia you should not miss!